This package starts by introducing 5 sight words. 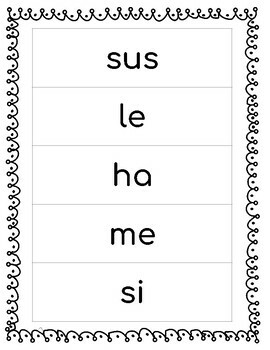 There are 5 different activities for students to do to continue practicing these sight words. The sheets are labeled with each day of the school week. 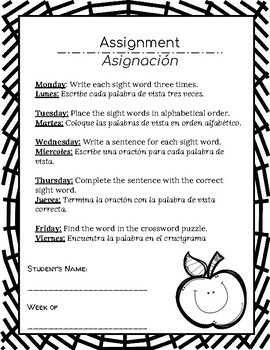 These activities can be used in the classroom or it can be used as a homework package. The instructions are in English and in Spanish. In case you would like to use it as a homework, parents will be able to understand what to do. Hope this helps! 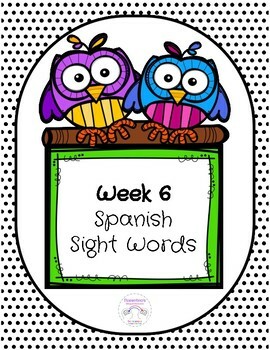 If you like this product you can get the bundle deal or other weeks with different sight words! Este paquete comienza con la introducción de 5 palabras de vista. Hay 5 actividades diferentes para que los estudiantes continúen practicando estas palabras de uso frecuente. Las hojas están etiquetadas con cada día de la semana escolar. Estas actividades se pueden usar en el aula o se pueden usar como un paquete de tareas. 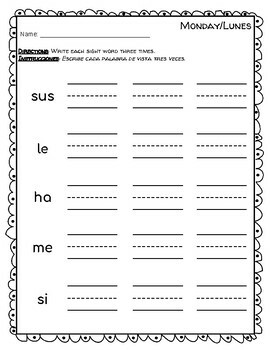 Las instrucciones están en inglés y en español. En caso de que quiera usarlo como tarea, los padres podrán entender qué hacer. ¡Espero que esto ayude! ¡Si te gusta este producto, puedes obtener el paquete u otras semanas con palabras de vista diferentes!